In the European Parliament a flash mob was held in support of Ukrainian filmmaker political prisoner of the Kremlin Oleg Sentsov, according to the information on the page of global campaign Save Oleg Sentsov on Twitter. 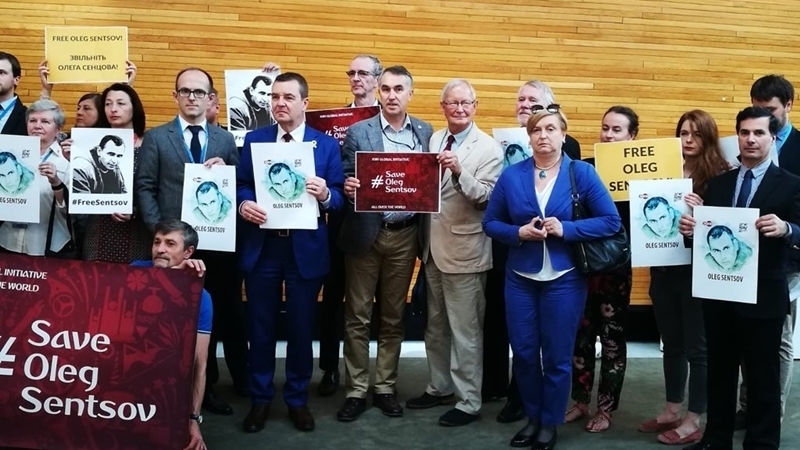 “An action was organized in the European Parliament in support of the Ukrainian political prisoner Oleg Sentsov, who was unlawfully convicted in Russia on charges of terrorism," reads the message. The event was attended by MEPs and delegates of the Permanent Mission of Ukraine to the Council of Europe. Parliamentarians called for the release of the Ukrainian political prisoner. QHA reported that Oleg Sentsov started the hunger strike on May 14, demanding the Russian authorities to release 64 Ukrainian political prisoners. On May 29, the Ukrainian filmmaker agreed to supportive therapy. Yesterday, May 31, political prisoner Oleksandr Kolchenko sentenced to 10 years imprisonment in the case of "Crimean terrorists" decided to go on a hunger strike in support of Ukrainian filmmaker Oleg Sentsov. Earlier, Ukrainian cultural figures appealed to the international football community to help in the release of the Kremlin prisoner on the eve of the World Cup, which is to be held in Russia.